Sometimes I like to check out restaurant menus to get ideas for dinner and desserts. The other day I was perusing the menu from Fuego Tortilla Grill in Texas – never been there but would love to visit one day…on the dessert menu I saw Magic Cookies with graham cracker crust, condensed milk, chocolate chips, shaved coconut and chopped pecans…sounded incredibly delicious! Come to find out that the original recipe came from Eagle Brand condensed milk. 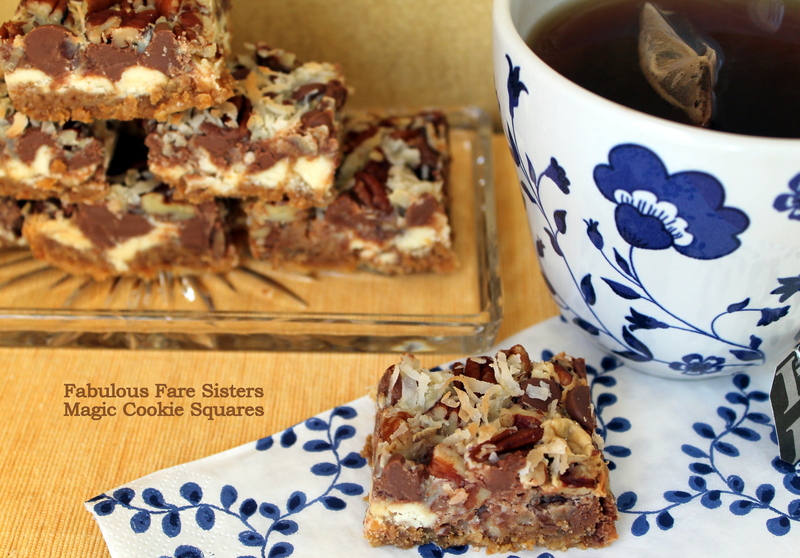 I’ve made a few adjustments to the original recipe, but they’re truly decadent! Heat oven to 350 degrees. Grease a 13″ x 9″ baking pan. Place the crushed graham crackers in a mixing bowl and add the melted butter. Press the buttery graham cracker mixture into the greased baking pan. Pour the condensed milk over the crust and spread evenly. Sprinkle the white chocolate chips and the milk chocolate chips over the condensed milk. Spread the chopped pecans over the chocolate chips; follow up with the shredded coconut. Using a spatula, press the entire mixture down into the baking dish. This recipe has been shared on FoodieFridiy, Fiesta Friday, Saucy Saturday and Senior Salon, along with Weekend Potluck, IdeaBox and The Pin Party! Go check it out and see some really great recipes and ideas! So much yum! I am the world’s worst cookie baker, so am excited that this recipe looks like I could actually not ruin them. Yum! 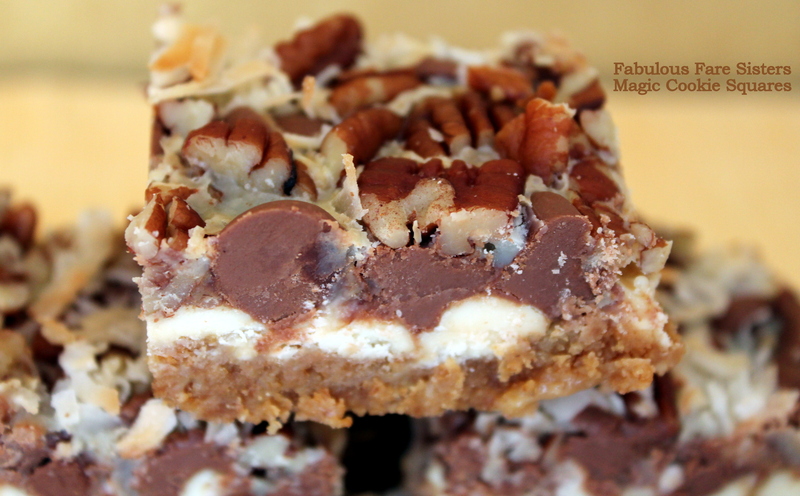 I made these when I was a kid – we called them 7 layer bars. If memory serves, we used butterscotch chips instead of white chocolate, although I often throw in whatever I have (and sometimes more layers, too.) These look amazing and have brought back so many good memories! Thanks for bringing this by Throwback Thursday! They look absolutely amazing, Linda! Magic! I love how simple these are! And they look soo amazing. Can’t wait to give them a try! Happy FF! Thanks Andrea!! See you next time!! Oh goodness! How scrumptious do these look?! Oh my gosh, I would love a couple of these. I took a look at those photos and just started drooling! I made these – soon good. I love these and haven’t made them in so long. Thanks for the recipe! Pinning to remind myself to make them soon! Killing me with that photo! GREAT job!!! I am drooling looking at these, Linda! These will be perfect for Valentine’s Day! They look so good, rich and chewy. Aww, Linda, this looks delicious but once in a while..lol. I’m with lynne hoareau…had every intention of a no carb week but these look so good and so easy I may have to postpone my plan. N.
This almost makes me wanna go off the healthy train! Ah god, it’s over for me then. Yum! 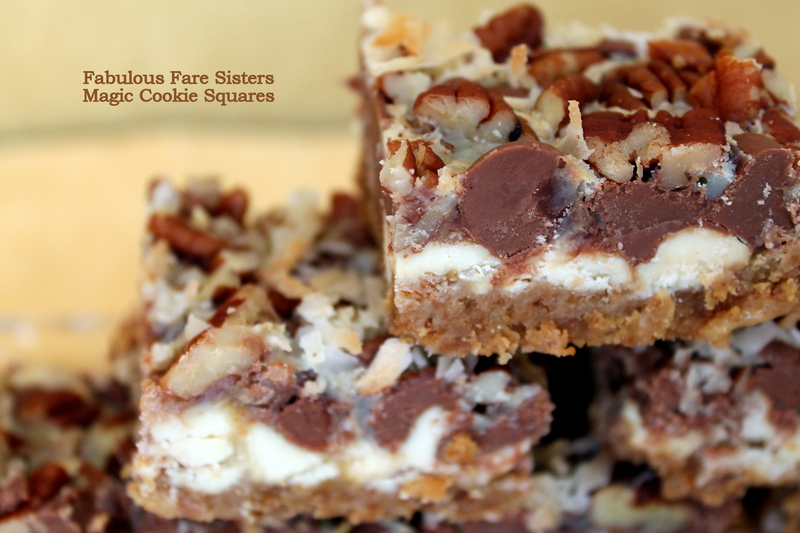 I love bar cookies, and these sound yummy.